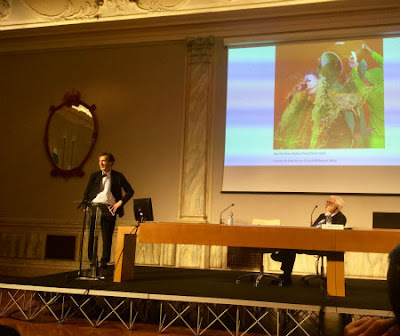 (Venice, Italy) At the press conference today, March 7, at Ca' Giustian, La Biennale's headquarters, Ralph Rugoff, the curator of the 58th International Art Exhibition said in the age of Twitter we are actually getting less information. People group up and follow like-minded people, and block those who have another point of view. Rugoff gave his presentation with a twinkle in his eye. 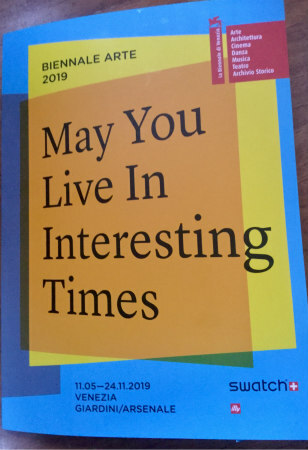 The title of this year's exhibition is "May You Live in Interesting Times," which had been described as an ancient Chinese curse, and used by prominent individuals like Winston Churchill, Bobby Kennedy and Hillary Clinton. But the phrase is "fake news." In reality, there is no such curse, which Rugoff thought was an apt title for the times in which we live. The feeling that we are living in a period of crisis is always with us. There are no alternative facts, but there are alternative points of view. Artists have alternative perspectives. In his written statement, Rugoff said, "Let us acknowledge at the outset that art does not exercise its forces in the domain of politics. Art cannot stem the rise of nationalist movements and authoritarian governments in different parts of the world, for instance, nor can it alleviate the tragic fate of displaced peoples across the globe... But in an indirect fashion, perhaps art can be a kind of guide for how to live and think in 'interesting times.'" This year's Biennale has no theme. The exhibition will let the audience have a conversation, and they will decide the thesis. There are 79 invited artists, less than previous years. The same artists will have works both at Arsenale and Giardini, but these works will be completely different in each venue. You will have no idea that they are made by the same group of artists. 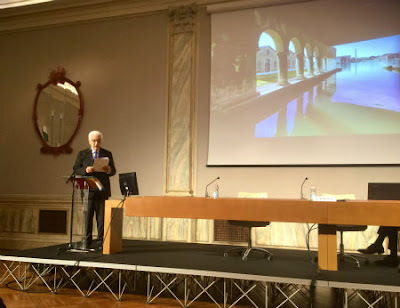 Venice Biennale President Paolo Baratta - Photo: Cat Bauer President Paolo Baratta said that twenty years have passed since, in this same location, he presented his first Exhibition as President after the Biennale underwent major reform in 1998. "Let me tell you, they have been very interesting times." During these years, the number of visitors has increased, and La Biennale found a new partner, Swatch. The increase in numbers has allowed La Biennale to cut back on the need for partners. "Our visitors have become our main partner; more than half of them are under 26 years of age. Calling notice to this result seems to me the best way to celebrate the twenty years which have passed since 1999." President Baratta asked Curator Rugoff what the reaction of the artists was when they were invited to participate in the Venice Biennale. Rugoff said that there are so many Biennales these days that many of the artists have become jaded -- but not when it comes to the Venice Biennale. When they learn they are invited to participate, they are excited. There are also Special Projects, Biennale Sessions (the project for Universities), Educational, Publications and more. Go to La Biennale for more information.